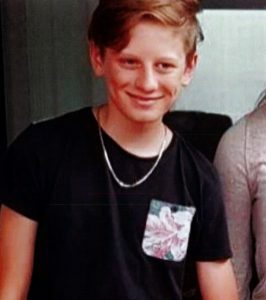 Police are appealing for public assistance to help locate a boy last seen at Penrith last night. Blake Spiteri, aged 14, was last seen at Penrith Railway Station about 6pm on Saturday, June 16. He failed to return home to the Blue Mountains and officers from the Blue Mountains Police Area Command were notified and commenced inquiries. Blake is described as being of Caucasian appearance, about 160cm tall, of a slim build and with blond hair. He was last seen wearing a black jacket, black pants, red sneakers, and red baseball cap. Anyone with information, or that sights Blake, is urged to contact Crime Stoppers immediately.